I commute 2 hours a day, so I listen to a lot of audiobooks. The one I’m listening to now is “Version Control” which so far is excellent. The main character’s husband is a scientist, her father is a minister, and at one point the two are having a debate. The debate brings in a concept of “non-falsifiable theory” – things that if proposed, can be taken as givens because they cannot be disproven. This would include statements like “there is a God” and “that person is thinking about the color green”. It’s an interesting philosophical debate, but I found it hits the nail on the head with one of the things that bothers me about religion. To me, religion is the domain of the unknowable. Questions of: “what happens after you die?”, “was the creation of the universe an act of consciousness?” – those are great, well in the bailiwick of religion. Do you need there to be an invisible dude above you to get through the day? Fine, believe that. What really bothers me is when religion (specifically Christianity, because they seem to do it the most, and most vocally) tries to branch out into knowable territory with the same air of authority. This is especially the case with Bible literalists, who insist all sorts of crazy things are fact despite vast scientific evidence otherwise. The thing is, there is still room for miracles, plenty of unknowable-ness for religion to coexist with science. For example, the Big Bang – many Christians hate the Big Bang theory because they think it excludes God – but the beginning of the universe is a really fuzzy thing for science to nail down, who’s to say it wasn’t God snapping his fingers or whatever? Likewise, Christians rail against evolution, but one of the primary mechanisms for evolution is chance, which is prime God territory. Instead of God creating all animals at once, why not nudge chance with a mutation here instead of there, and eventually end up with a pony? 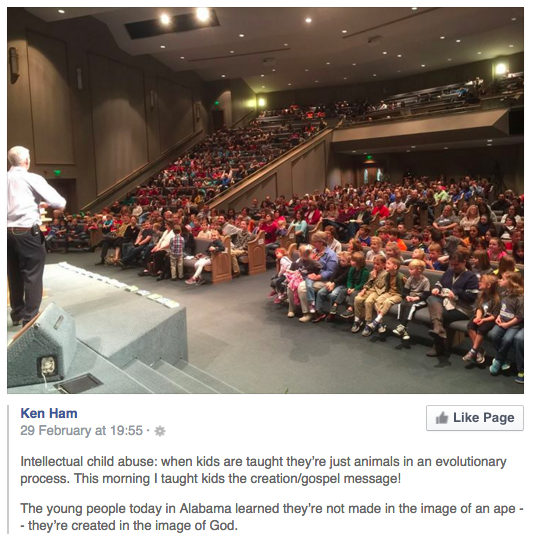 Instead, you end up with people like Ken Ham calling teaching science “child abuse”. The main issue here is that the Bible as literal fact does not jibe with testable reality. It is demonstrably wrong in places, but that doesn’t sway “believers” – they insist that science must be wrong, or reality must be wrong, because the Bible must be right. That is what bothers me. And it doesn’t stop there – because the “facts” in the Bible conflict with scientific fact, Bible literalists reason that all of science is flawed, and conflate it to a “war” between science and religion. This takes the form of propaganda campaigns as well as legislation, usually on a state or local level, promoting Bible-based “science” and removing actual scientific content from classrooms. Even when these are struck down, they remain in practice, particularly in the South. A 2004 ABC News poll found that 61 percent of Americans believed the account of creation in the Bible’s book of Genesis is “literally true” rather than a story meant as a “lesson.” 60 percent also believed that the Bible account of Noah’s Ark and the global flood was fact. In 2014, Gallup did a poll of 1000 adults throughout the US and found that 42% believed that God created humans in their present form, 31% believed God guided human evolution, and 19% believed humans evolved naturally. The story of Noah is not only physically impossible, and a laughable concept (one family went out and gathered animals from all over the world and put them in a boat for a year? ), it is provably false. Yet in polls, a majority of people believe it is fact, because “the Bible tells them so”. This marks not only a lack of critical thought, but a willful ignorance. These often result from insular religious communities – things and ideas that are viewed as conflicting with religion are branded “satanic” and banned from the community. It’s a cultish exclusion from the “outside” world that promotes one world view (Christianity) by vilifying other views that are seen as conflicting, including science at large. This creates not only a specific mindset (any mindset is going to be specific to upbringing) but one that is hostile to the rest of the world. The quote above by Ben Carson is typical of this type of mindset – here he says that he believes that the theory of evolution came from “the adversary” – Satan. The Bible says God created the animals all at once, in one day, so it must be so, despite all evidence to the contrary – so that evidence, and anyone pointing it out, must be under the sway of Satan. Everything and anything that contradicts the Bible is evil, and must be fought against. And this is where it gets very scary – they believe they are in a constant state of “spiritual warfare” against the forces of Satan. This can take two forms – one is an internal struggle to eliminate all “evil” thoughts – some of which are moral dilemmas (“I shouldn’t steal that”), but some of which are resisting other views (like evolution, astrophysics, or coloring books). The other is an external struggle to “protect” everyone from the perceived evils by taking them on either legally (e.g. electing school board officials who promote religious teaching or censor other viewpoints) or illegally (e.g. attacking doctors who perform abortions). The thing is, this is an isolationist, scary mindset, and when Christians see another group with a similar type of mindset, like Muslims, it terrifies them, but they cannot see it in themselves. A lot of this all stems from taking an essentially indefensible position – that the Bible is the Word of God and therefore literally true – which sets up an “us vs. them” where the “them” is almost everyone else, especially scientists. That reaching of religion from questions of faith (the “non-falsifiable theory”) to questions of reality is one of the core parts where religion falls in on itself, and the constant effort to defend the indefensible puts religion at odds with science where they might otherwise exist in essentially two different domains. It’s not the only problem I have with religion, but it’s the one on my mind today.